Let’sbe honest here–Facebook isn’t slowing down. There are more than 1.86 billion monthly active users on Facebook, which includes a 17% spike in two years. Foryour business, brand or enterprise company, this channel is unavoidable ifyou’re truly trying to create a worthwhile play in social media marketing. Your Facebook marketingstrategy has to be unique. There’s an ocean of potential customers you canreach on Facebook. But with a larger pool, it’s harder to dissect and find yourspot within its space. That’s why we created thisFacebook marketing strategy for 2018, which includes seven essential steps tonot only get started, but also create an impressive plan. Get started now. Every marketing strategyyou’ve read–at least the good ones–probably suggested to create goals for yourspecific market. The reason everyone mentions this is because goals areessential to address your biggest marketing needs. If you’re considering usingFacebook for marketing or looking to improve upon an existing strategy, youobviously have some needs. Don’t create unrealistic goals that chase vanitymetrics like followers and Likes. Instead, address your biggest challenges withFacebook or social media in general through proper tracking tools. Your CEO most likely sent outan inspiring email or gave an enthralling speech at the end of 2017 outliningthe core goals for 2018. OK–maybe it wasn’t life changing, but we bet if youlooked back, it has everything you need for your Facebook marketing strategy in2018. Increasing quality of sales: Improving the quality of sales starts with better targeting (we’ll address this more further down). Through a well-planned Facebook marketing strategy, you reach your target audience more efficiently. Just because the pond is bigger, doesn’t mean you’ll get bigger fish. Work on what you know best and use Facebook as a source to improve your reach. Adding more value to the organization: Facebook can better nurture customers, improve awareness and provide more resources to you audience. Make Facebook your go-to source of information. Better pulse on the industry: Are your competitors always one step ahead? 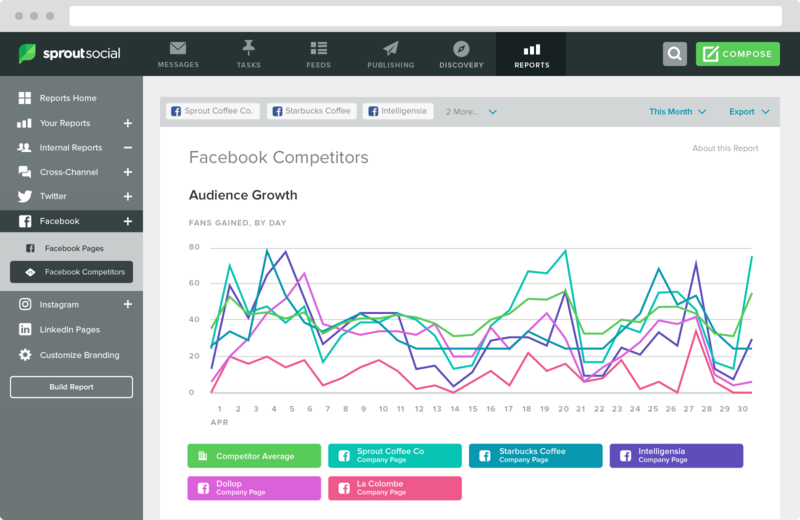 With the help of social media monitoring tools, you can track, listen and report on all social conversations revolving around you, your competitors or the industry. Always try to increase your listening powers before speaking. More efficient recruiting: No one said social recruiting is easy, but it’s only growing in popularity. Social can be a great source for increasing recruiting efforts and reaching top talent faster (we’ll also talk about this more later). Working your employees’ social networks for a higher social reach makes your chances of recruiting higher quality employees better. 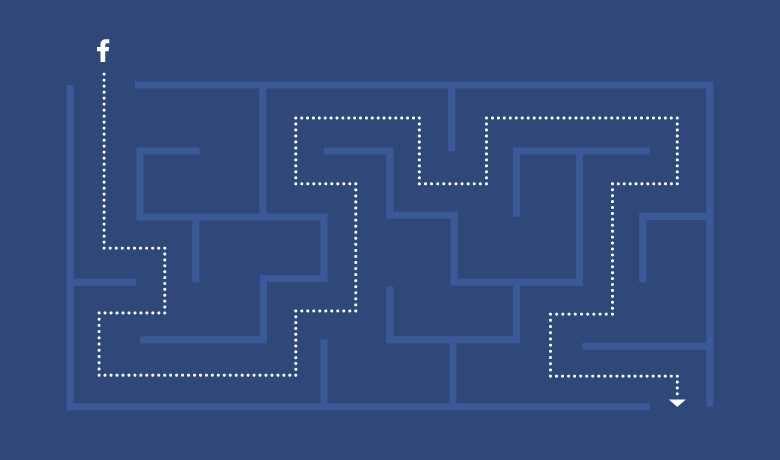 Smarter growth: Reducing churn, limiting spend and increasing acquisition are all parts of a successful business, but Facebook can help you in each of these areas. Whether it’s through ad spend, increased targeting or more social selling, addressing your Facebook marketing strategy can help you get closer to these goals. These goals won’t addresseveryone’s needs, but you can see a trend on how better social media marketingcan affect the entire organization. You’ve heard it a thousand times, work smarter not harder. Demographics are key to anymarketing strategy and on social media, it’s no different. When looking atFacebook, you have nearly 1.15 billion people scrolling through their feedsevery day, so it’s important to know who you need to reach and how. 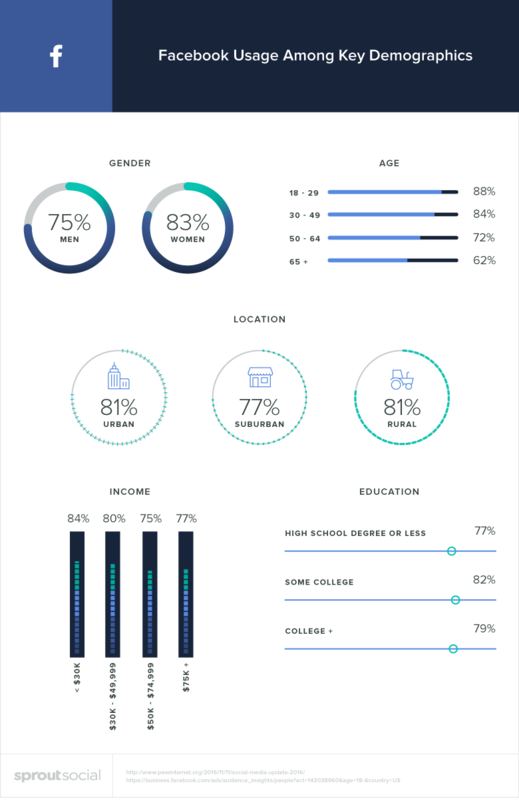 Data from the Pew Social Media Update 2016 report showed women tend to adopt Facebook more frequentlythan men and the core age group is 18-29. However, with 62% of 65 and olderusers on Facebook, your band has a much better reach across age groups than anyother network. Pro Tip: don’t limit yourself because you think younger generationsare only on Snapchat and Instagram. Facebook is still most used network among18-29 year olds. Facebook’s demographics spreadacross all primary locations and income pretty evenly. However, urban and ruralareas both have 81% of their demographics on Facebook, while suburban areasmake up 77%. As for income, data shows thehighest amount of Facebook users (84%) make less than $30,000, while 77% makemore than $75,000. Pro Tip: Again, Facebook’s versatility shouldn’t prevent you fromexploring targeting your most core business demographic. More likely than not,you have better reaching power here than other social networks. Each social network has it’sown style of content, but Facebook tends to jump the line. With FacebookStories, Live, image and videos posts, your brand’s content strategy hasendless opportunities. For your business, it’s aboutthe quality of content and what your audience should come to expect fromyour Facebook Business Page. 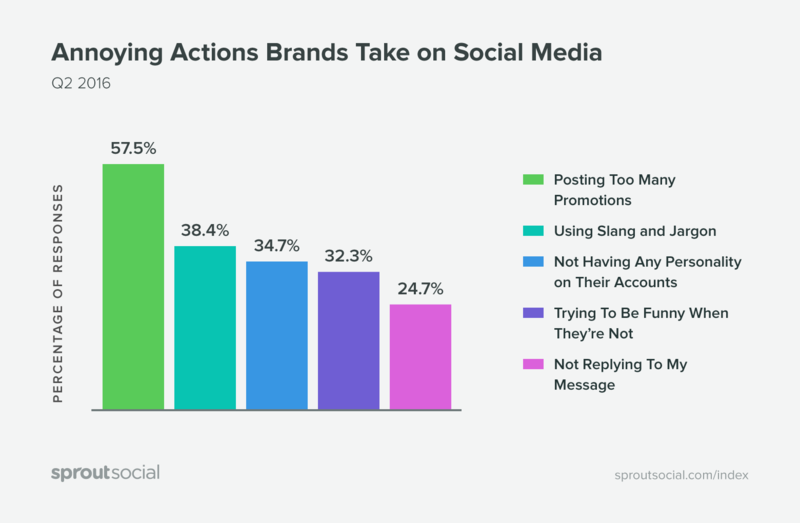 Remember that being overly promotional can have its downside.According to the SproutSocial Q3 2016 Index,57.5% of social media users said posting too many promotions was the mostannoying action from brands. Your Facebook Page shouldn’tbe like a used car lot–full of ready-to-pound salesmen. The content you produceshould be compelling, entertaining or helpful to your audience. People knowthey can get an elevator pitch on your website or ad. But this doesn’t meanyour social networks, especially Facebook, have to be a home for promotions. Highlight your brand values,identify your audiences and create a space that is unique to your company. Status: The simplest form of communication can sometimes be the most powerful. With new features like larger text for shorter messages and the option to put your text on a colored background, you can get your essential message out in a more vibrant and eye-catching way. Images: Posts with images drive 2.3 times more engagement, so being visual helps. But don’t rely on images to do all the work–put effort into high-quality photos and awe your audience. If your product is considered “boring,” use beautiful images to highlight your brand’s creative side. Inspire users with virtual reality features or 360-degree content. Videos: Video is in high demand and 43% of users would like to see even more from marketers. However, only 15% of Facebook videosare watched with sound. Video should be accessible, easy to digest and always have captions. Create videos that catch a user’s attention and provides something worthwhile. Links: Links are perfect for sharing industry news and your own blog content. Find your most engaged content and continue to share it on Facebook. It’s not easy doing so organically, but it shouldn’t stop you from posting your best content. Facebook Live: Live content drives three times more engagementon Facebook. With in-the-moment content growing in popularity, see how your brand can give sneak peeks into industry or office events, product launches and other behind the scenes content. Go Live, wow your audience and engage. Facebook Stories: Facebook Stories are in-the-moment content clips. This was based off Instagram Stories, which ultimately were from Snapchat Stories–seeing a trend here? Brands have tested their efforts on Snapchat for a few years now. But with the newest release, you can attempt this style of content with one of your biggest networks. Follow our Snapchat guide for ideas! The last thing you want to dois hastily post something to Facebook for the sake of publishing content.Planning content means you put more effort into the quality of a post. Thisgives you a higher chance at engaging and inspiring your audience. However, you don’t always havetime to create content. That’s why using a social media publishing tool like Sprout Social can help you stay on track withcontent. 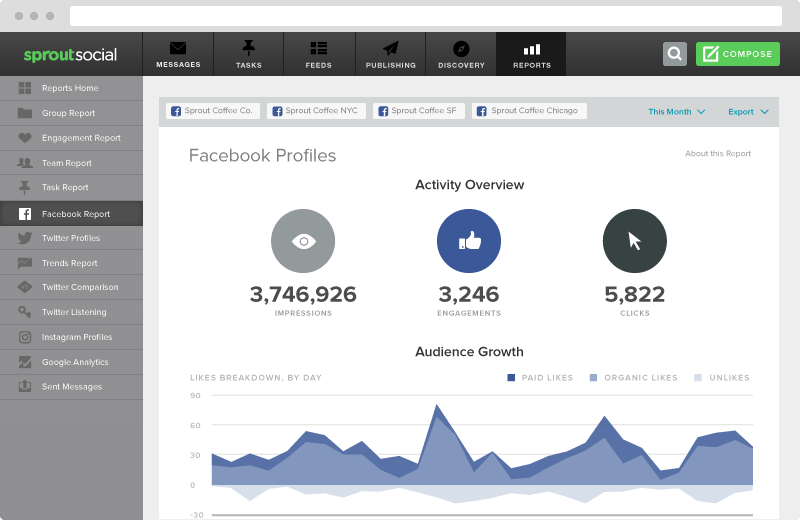 Easily view, monitor and maintain your Facebook publishing with thesocial media calendar view. 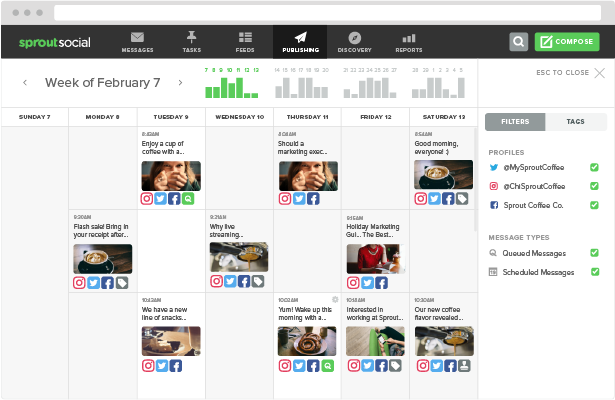 With our scheduling tools, youcan set up posts across all networks and build your Facebook content for weeksin advance. Don’t rush to schedule. Save time and plan ahead with a tool thatmakes it easy to manage and publish all at once. Check out our guide on how tocreate a calendar below! Maybe you read the previoussection and thought–nice idea, but it seems like a lot of work for littlepayoff. Well, you’re not totally out of bounds with that idea. According to aSocialFlow study, Facebook organic reach dropped a massive 52% in 2016 and has fallen even more in 2018. However, you should always put moreeffort into your social media strategy than what you expect to get in return.Growing your audience and brand loyalty doesn’t happen overnight. You haveto earn it. But there is one shortcut toget there a bit faster–social media advertising. Specifically on Facebook,there are more than 4 million advertisers with just an average click-through rate of 0.9%.Advertising on Facebook is simpler, but not easier. You still have toeffectively build your brand and showcase it perfectly with ads. For starters, you want to staywithin your allocated weekly or monthly spend with Facebook to avoid overexposure and useless clicks. Ad spend can shoot up in a hurry when you’retargeting isn’t effective or set appropriately, which brings us to the nextstep. Your Facebook ad has to berelevant. Targeting a broad audience isn’t a bad thing. At first, you want toactually see what works best to build awareness. However, relevance is crucialtoward great Facebook ads. Try to build custom audiencesand address customers who would best fit your Facebook content. If it’s aretargeting measure, make sure the content provides something recognizable butalso something new. We’ll mention it again, butquality over quantity will always prevail. Earlier in this post, we did a deepdive into the types of content on Facebook. Now it’s time to choose whichpieces of content you think are worth advertising in front of a much largeraudience. Identity: Does it relate to your brand and effectively showcase your product/service? Are your logo and business colors correctly displayed? Reward: What do viewers get out of it? Is it a deal, promotion, offer code, whitepaper or industry guide? Tone: Does your content maintain the same tone across your entire Facebook page or business in general? Action: Your content must drive an action, which goes back to your Facebook goals. A clear and precise call to action is best. Facebook ad content isliterally squeezed between your friends and family feed, which means it’s seenoften. Have you ever deemed a TV commercial the worst ever and seenit replayed endlessly through your favorite show? This is the same thing. Don’t let your content getstale with viewers, so make sure to update and repurpose your ad content everyweek or two. The whole purpose is to drive users to a specific site orpurchasing page. So don’t let old content ruin your Facebook retargeting orremarketing efforts. Click-through Rate: If traffic is essential, track CTR and see where you can improve. Impressions: Having trouble with visibility? Revisit your image or content and see what can drive more impressions. Cost to Acquire: If your purpose is to limit spend and budget more effectively, track cost to acquire and set weekly or monthly goals. Like most social mediachannels, they’re built as networks to converse, discuss and share content. Asa brand, you can’t forget that basic idea of what makes a social media network.That means conversation and engagement should never be put on the back burner. Instead, try to be a communityfor your audience. Facebook is a great place to hold industry chats ordiscussions, whether it’s with a different audience or your own customers.While Twitter often gets all the limelight of being a social customer care mecca, don’t forget about Facebook too. You can help drive Facebook engagement by asking people to simply engage in the first place.However, you can’t sit back and wait for your followers to interact. You can’treach everyone, but there are ways to increase engagement. 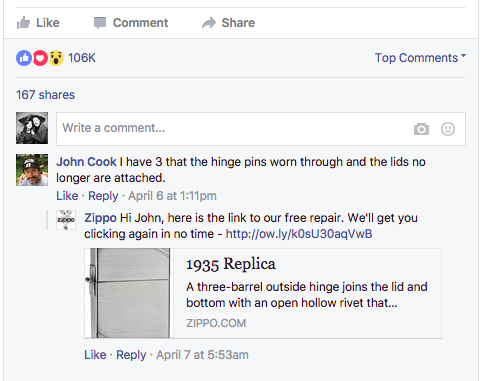 For example, Zippo does a great job at interacting with users on severalcomments and continues the discussion on Facebook. The brand also acts as asource for info for loyal customers. Thursday is the highest recommended day to post. 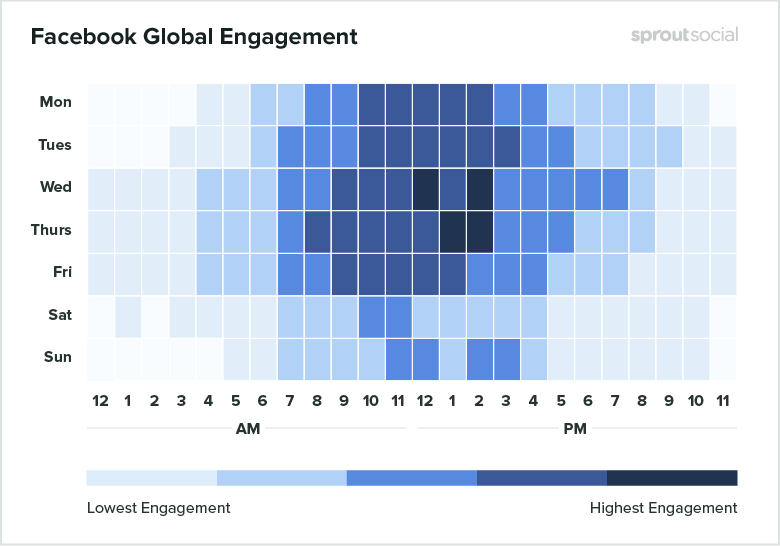 Noon and 2 p.m. on Wednesday and 1 to 2 p.m. on Thursday are most engaged times on Facebook. You’re safe to post weekdays between 10 a.m. to 3 p.m.
Saturday is the least engaged day of the week. The least recommended times include early mornings and late nights. Like we mentioned earlier,social media works as a great resource for employee advocacy. By providingemployees with shareable content, you’re able to reach their audiences. 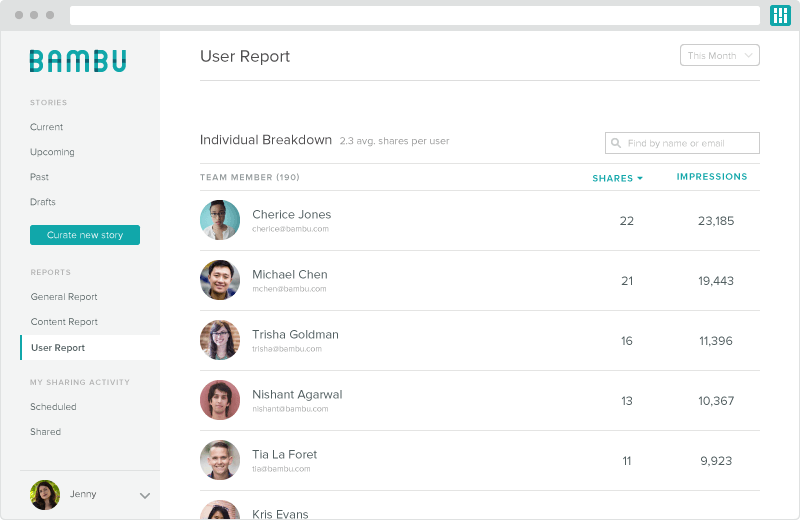 Thismakes your company’s reach all the greater when you can get content sharedthrough your employees’ feeds. 1. They’re afraid to share company content on networks likeFacebook. 2. They’re too willing to share company information on networkslike Facebook. A marketing data report fromBambu showed 54% of people don’t know how toshare the right content and bean advocate on social media. When the same report shows 70% of employees usesocial at work, you have to build an advocacy platform to enable their reach. It all starts with an employeeadvocacy program that allows your staff to use their biggest networks likeFacebook to share company info. Luckily with tools like Bambu, you can easily track, measure and promotecontent from within your walls. Use Facebook as a tool to showoff company perks, highlight awards or even promote new job openings. Givingthem easy-to-use tools makes sharing a sinch. Utilize your employees have andhave your employees help promote your business on Facebook. Last but not least, asuccessful Facebook marketing strategy needs to be analyzed–strenuously. We’vealready mentioned some ways to carefully analyze your best times to post,Facebook advertising metrics and the types of content to publish. If you plan to improve yourstrategy for 2018 and into 2019, it takes helpful insights from Facebook analytics tools and its competitor analysis features. Ourbeautifully-designed reports give access into multiple Facebook Pages, activityoverviews and content reports to see what works best. To be truly successful, youneed insights on what works. That’s why social media tools are a must for anymarketer trying to get ahead of the game in 2018. We’d love to know what you doto be successful on Facebook. Feel free to comment below! Sign up to have social media resources sent to your inbox everyweek.